Yesterday, Heather (Gluten-Free Cat) shared her eye-appealing, gluten-free, vegetarian Christmas Breakfast Casserole. 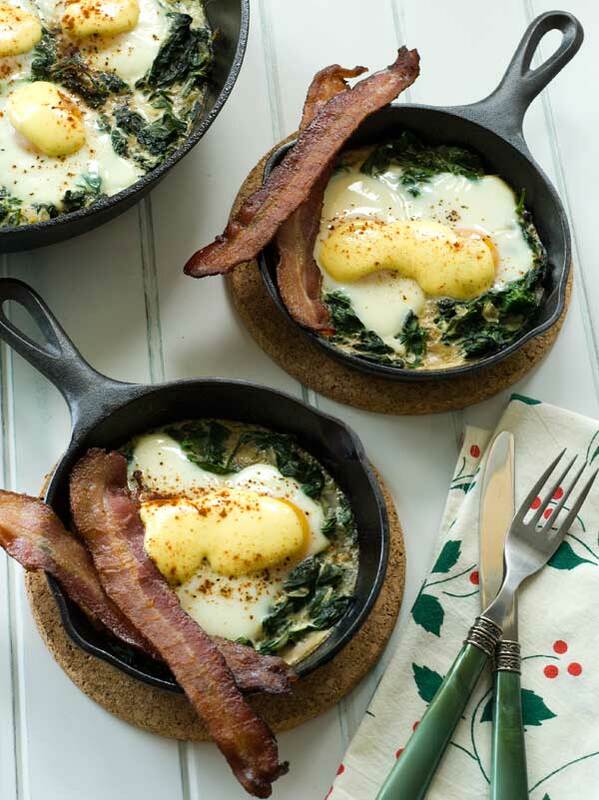 Today for Day 20 of our Home for the Holidays … Gluten-Free Style series, yet another good friend, Carol (Simply … Gluten-Free), is sharing another beautiful baked dish for your holiday breakfast or brunch—Baked Eggs Florentine. Made with spinach and a quick Hollandaise dish, Carol promised that this dish is easy to make and sure to impress. It definitely impresses me! Carol also shares some lovely memories and traditions in her post. You can fully imagine all the fun, joy, and, of course, wonderful food in the Kicinski house at Christmas. Carol is a delightful dynamo in our gluten-free world! She’s a fun and positive spirit and every single recipe she makes is gorgeous and delicious. You can see that from following her blog for just a short time (and certainly today’s recipe demonstrates it!) 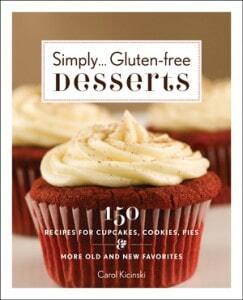 or by checking out her cookbook, Simply … Gluten-Free Desserts. You can get a bit of a preview of her cookbook in my post that shares Carol’s gluten-free, dairy-free Chocolate Pots here. These were made for Carol’s audience at her demo at the Gluten-Free and Allergen-Free Expo in Chicago last May. There were some very happy folks in that audience … let me tell you! Carol is also giving away some more valuable resources for those who are gluten free and/or trying to live healthier. 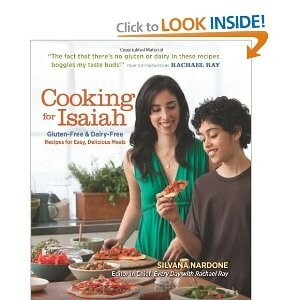 Cooking for Isaiah ~ This great cookbook from Silvana Nardone (Silvana’s Kitchen and Easy Eats) has been shared before in our holiday series, but how lucky that you all get one more chance at winning it! Read my review here. 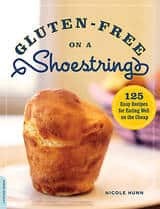 Gluten Free on a Shoestring ~ Nicole Hunn’s cookbook is another very popular one. You can check out the reviews on Amazon that all come together for a 4 1/2–star rating for this book. You can also visit her blog by the same name. Her latest post? Chocolate Doughnuts … whoa, now, let me step aside before you all rush out. Don’t need any stampedes here at gfe! 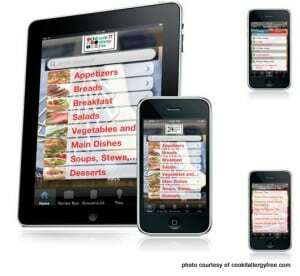 Cook IT Allergy Free app (2 copies) ~ I’ve already professed my love of this app several times. Check out my review and read more about Kim here. Oh, and you can get her Chocolate Fondue recipe that’s also part of the app, too. Ha ha … I knew I’d get you on that one. First Nicole’s doughnuts and then Kim’s fondue … I know how to lure you in! Head over to Carol’s to get her great Baked Eggs Florentine recipe and enter for these prizes! Four prizes. Four winners. All entries go to that grand prize of the Vitamix (5200 Super Healthy Lifestyle package!) and the second and third prizes, Free From Gluten shopping spree ($150 value) and Caveman Cookies gift package ($89 value), respectively. This week’s winners will be announced shortly, including the added giveaway of Katie Chalmer’s Mommy, What Is Celiac? book that comes with a cupcake holder in this case … a sweet bonus. Katie’s book is a great one to beautifully explain the need for eating gluten free and presents such a positive outlook on gluten-free eating. It’s one of my favorites! Katie has a 30% off special on her book right now on her site. With shipping that means, that you can purchase her book at a price that less than Amazon’s price, and she says that most of the time, her books arrive in less than a week. Her book would be a great gift for a child making the transition to living gluten free! 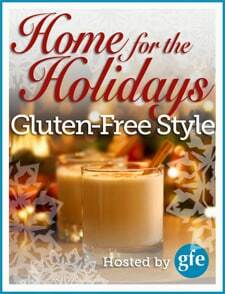 Tomorrow, we have Alisa from Alisa Cooks (and Go Dairy Free) sharing her “home” and “holiday” recipe with us all … I can’t wait! « Home for the Holidays: Heather of Gluten-Free Cat with Christmas Breakfast Casserole + Cookbook + Resource Book + Magazine Subscription! Can’t wait to try this. Love eggs and spinach combination. Trying to cook healthy, gluten free meals. It’s nice to see you here commenting again! 🙂 This breakfast dish is healthy and beautiful, isn’t it? Enjoy!